As I said in a previous column, I can't imagine watching TV without a TiVo or other personal video recorder. The ability to record shows on the machine's hard drive completely changes the nature of watching TV. Unlike a VCR, there is no tape to mess with, and the TiVo's programming guide makes it a snap to program your shows up to two weeks in advance, obtain a "season pass" to get all episodes of a program or have it automatically record shows that include your favorite stars or directors. It's especially great for parents who can use it to record child-friendly programs that their kids can watch at any appropriate time. Like all devices that use a hard drive, the amount of information you can store on a TiVo is based on the capacity of its drive. TiVo offers two options, a "40 hour" system and an "80 hour" machine. I put these in quotes because those time estimates assume that you are recording in the lowest-quality ("basic") mode. In fact, an 80-hour machine has an 80 gigabyte drive. You get just over an hour of lowest-quality programming per gigabyte. If you want to record at the highest quality, you have to divide those numbers by three. I have an older model TiVo with a "60 hour" drive, which gave me about 20 hours of programming at the best quality. Sony and other companies offer TiVo-compatible systems with varying drive sizes. Twenty hours is a lot, especially compared with a videotape, but once you get hooked on TiVo, you find yourself doing a lot of recording. Besides, I travel quite a bit and there are periods when several weeks go by before I get around to watching the programs I've recorded. By default, older programs are erased automatically to make room for new ones, which means I miss some of my programs. But those days are over. I just upgraded my TiVo by replacing the 60 gigabyte drive with a 120 gigabyte drive that will record up to 40 hours at the best-quality setting, 62 hours at what TiVo calls "high" quality, 83 hours at medium quality or about 140 hours at the lowest -- basic - quality. TiVo doesn't sell replacement drives nor does it officially sanction users upgrading their systems with third-party drives. However, a TiVo representative told me that the company has no objection to people upgrading their systems, though it does violate the warranty because drive replacements require users to break a warranty seal when they open the box. TiVo warranties its recorders for 90 days (parts and labor) and one year (parts exchange), so if your machine is more than a year old, you don't have a warranty anyway. From a hardware perspective, TiVo uses industry standard hard drives that are virtually identical to the ones used on most desktop PCs. But to work in a TiVo, they must be formatted with special software that runs under the Linux operating system. There are Web sites (most notably tivocommunity.com that provide instructions on how to do this, but it's not for the faint of heart. You have to first download some software off the Internet, then install the new drive in your PC to format it and load the software and, finally, take it out of your PC and install it in the TiVo. A much easier solution is to buy a pre-formatted TiVo-compatible upgrade kit from Weaknees.com. The 120 GB kit that I installed costs $199, which is about $50 to $80 more than what you might pay for an unformatted drive at an Internet discounter. But in addition to a drive with all the right software pre-installed, the kit came with excellent instructions, necessary tools (two hard-to-find "Torx" screwdrivers) and a phone number you can call if you need help. 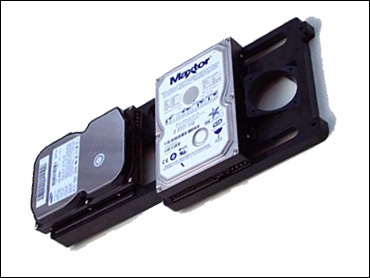 The company sells other sized drives, including an option that lets you add a second drive to your existing system. It took me about a half-hour to take apart my TiVo, remove the old drive, insert the new one and put the cover back on. The hardest part was removing the cover and - thanks to the instructions - that wasn't too hard. You do have to be careful: Use a firm tug when you remove the drive data and power cables. But it's not really difficult. It's certainly easier than replacing a hard drive on a desktop PC. Once the hardware was replaced, I hooked up the TiVo and had to go through the configuration routine as if I had just bought a new machine. That took about 20 minutes, plus several hours while the machine did some unattended housekeeping to re-establish its software. I also had to re-enter all of the shows I wanted to record, but that's pretty easy to do with a TiVo. In addition to having more space, the TiVo also is a bit faster. With the old drive I would have to wait several seconds when I entered programming codes. With the new one that process is almost instantaneous. The folks at Weaknees.com are incredibly helpful. One gets the sense that they too are TiVoaholics and really want to share their excitement with their customers. Even if you don't plan to buy an upgrade kit, their Web site has a lot of good information about TiVo as well as other related products.